There are so many people who have patios in their homes. However, you can find it very hard to sit outdoors because of too much heat and unexpected rains. Installing patio covers will help you to enjoy all kinds of weather conditions outside with your family and friends. There are several companies in the regions that can help you to install patio covers. You should look for one that will give you some ideas of installing patio covers. The primary intention of patio covers is to bring a new look into your backyard apart from being highly functional. Most people have a hard time in shopping for new patio covers ideas. No wonder most people have the traditional types of patio covers installed in their homes. In this article, we will be learning more about the patio cover ideas that you can implement for your home. You need something that is going to make your home to standout from the rest. The first idea is to utilize arbor as a patio cover. This is normally manufactured from metal or wood materials. This is a simple structure or framework that used vertically erected columns as a support. You can also use it in supporting growth of crops such as orchids that need a lot of support when growing. The top section of arbor should be a lightweight beam matrix. You can even hang or plant orchids and creepers on this structure once you install the arbor and properly erect the roof. In this case, however, you will not be able to use the patio when it is raining because the arbor patio covers do not offer protection from the rains. It is therefore recommended to use lightweight roofs that are compatible to block the rain from falling into the patio. 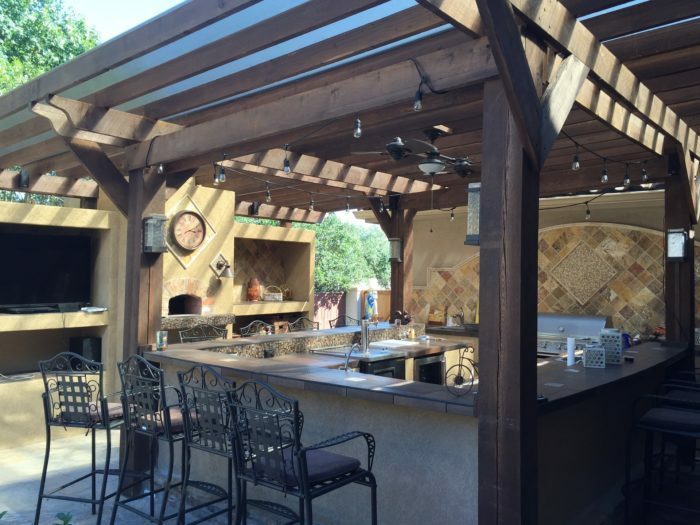 Make sure you get a highly experienced contractor to help you in installing these arbor patio covers. The second idea is covering the entire patio in such a way that it will appear to be a room that has huge French doors and the roof that totally cover up. This may sound quit weird but the good thing with this patio is that you can use it all types of weather conditions. In fact, you can use your valuable electronic devices such as televisions and patios in this type of patio. The patio is more functional even though it will cost you more than the arbor patio covers. You also need a highly experienced professional like South Florida Contracting Services to guide you through the installation process. The way these patio covers are installed determines how it is going to serve you. The last patio covers ideas that we are going to look at in this article is known as ‘sail away’. This is a very unconventional approach of installing patio covers. Sail is generally a piece of canvas that is one hundred percent waterproof. You can either attach it to supportive pools or tie it on the top of the arbor so as to make a perfect patio. You can either tie up or remove a sail patio with a lot of ease. It’s a convenient way of getting a portable patio cover at any time that you wish to. You can still use the same technique to create patio umbrellas by selecting different sizes and colors in umbrellas. You can make this patio cover to look highly attractive.